Wind energy projects do not lower surrounding property values, according to a study being released by the Center for Rural Affairs. Iowa is one of the nation’s leading states for wind power generation, with more than one-third of our electricity coming from the wind. Iowa’s goal is 40% by 2020. Nelsen says other types of development often -do- have a negative impact on land values. 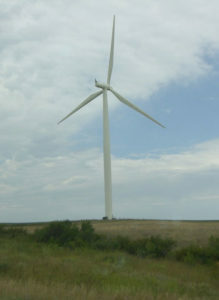 “It’s less from the actual wind turbine itself, it could be from other what are called disamenities,” Nelsen says. “That could be anything from if an area isn’t restored properly from construction, it could be from something entirely unrelated to a wind farm, a confined animal feeding operation or a wastewater treatment plant.” Nelsen says local officials and wind power developers need to be clear about what will happen with any new project, especially in regard to the land’s appearance post-construction. The wind industry employs some 7,000 Iowans. The study was conducted by the Lawrence Berkeley National Lab and the Universities of Rhode Island and Connecticut. The Center for Rural Affairs is based in Lyons, Nebraska.